I design one of a kind necklaces made out of sea urchins and shells that I set in a combination of gold and silver. I am truly inspired by my natural surroundings - the shells I find on Pawleys Island are the stars of my designs. 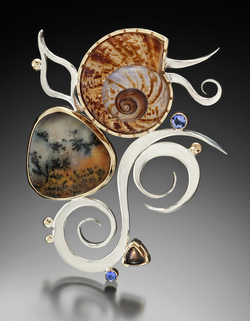 I use traditional metalsmithing techniques to create abstract settings that show off the natural beauty of my beachcombing finds. Each piece is hand fabricated out of 14ky gold and sterling silver, and set with natural seashells, freshwater pearls, and gemstones. click on the event names below for more information. 15-16 Winyah Bay Heritage Festival, Georgetown, SC. 29-30 Boca Raton Museum of Art Festival, Boca Raton, FL. 5-6 Art Fest Fort Myers, Fort Myers, FL.